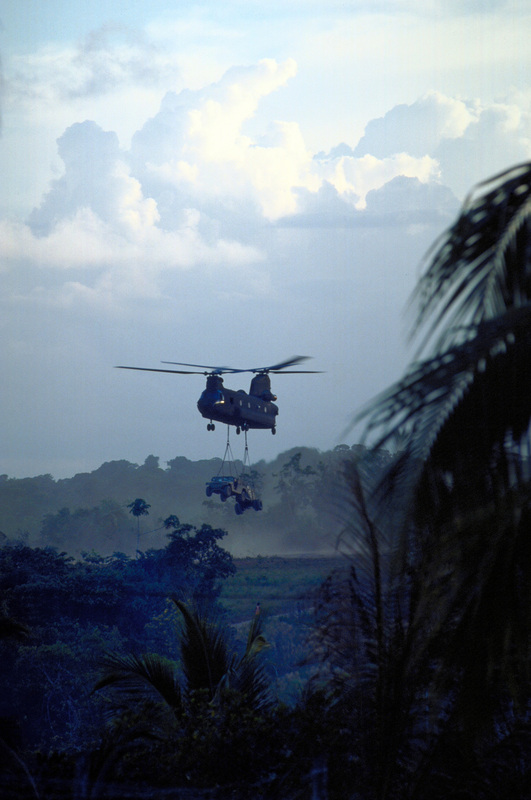 [Complete] Scene Caption: A CH-47 Chinook helicopter leaves the Kumaka airfield carrying a sling loaded High-Mobility Multipurpose Wheeled Vehicle (HMMWV). The CH-47 from the Army National Guard`s Det 1, 106th Aviation Squadron, Davenport, Iowa, will redeploy the equipment from Kumaka back to Camp Stephenson, Timehri Guyana. The equipment was used to assist in renovating the existing regional hospital as part of this first combined humanitarian and civic assistance exercise conducted between the United States and Guyana. Military personnel from Air Force, Air Force Reserve & National Guard, Army, Army National Guard and Marine Corps participated in the exercise which included engineering and medical readiness training.